Do you want to assure yourself that your baby will be safe even though you cannot be with him all the time? Thank goodness we now have a baby monitor to keep track of our precious angels 24/7. Baby monitors give parents the peace of mind they are after so they simultaneously can keep watch over their child and still accomplish daily tasks around the house. For this review, we are going to discuss the functions, advantages and disadvantages of the Angelcare Movement and Sound Monitor. When it comes to baby monitors, a lot of parents trust the Angelcare company. The Movement and Sound monitor is made to provide parents serenity and the baby more safety all the time. If you are a parent who is on the hunt for a functional sound monitor that has a compact size and includes a receiver that is completely rechargeable, then the Movement and Sound monitor is the product for you. The monitor comes with excellent sound intelligibility and a complete digital display which includes sound LED lights. The screen also shows temperature surveillance that allows parents to be in the know of the current temperature conditions in the nursery. If the temperature is too low or high, parents can quickly manage the problem. The unit also comes with a full-color display which has a graspable monitor and lets parents pay attention to certain essential information like sound, lights, and room temperature. The monitoring setup of the device works on a trusted 2.4GHz frequency band which guarantees a safe, secure and consistent transmission between the transmitter, which is the baby unit and the receiver, which is the parent unit. The monitor includes an out of range indicator, which releases an alarm whenever the parent surpasses the working range of the monitor. The model features an excellent 820 foot range so it allows parents to accomplish other chores in the house while still keeping track of their child. Furthermore, the device presents superb sound quality. The device’s battery life guarantees that one can make use of it without hassle all through the night. You do not need to charge the battery all the time and instead, guarantee that you can keep watch on your baby if required. The Angelcare Movement and Sound monitor has its drawbacks too. It has a typical baby monitor issue of static occurrence whenever the device’s volume is set to the maximum level. This static disturbs the effective transmission of signals that happens between the transmitter and its receiver. Because of this interruption, it gets in the way of keeping watch on the baby in real time. Furthermore, the monitor’s housing is also susceptible to breakage. The material of the casing can be improved on by the company though and we hope they can get through with this. You have to be careful when handling this device. It is also a good idea to keep the transmitter away from the baby’s reach. Another negative thing about this product is that it presents a false alarm, particularly if the device has been used for quite some time. 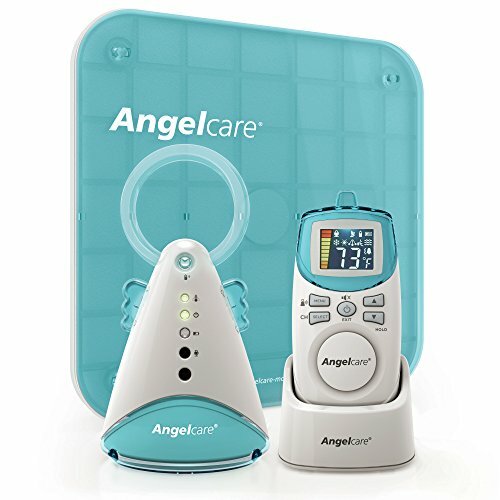 The Angelcare Movement and Sound Monitor is a great monitor that can be used every day at home. However due to its setup, the amount of parts and the crib requirements, this is not something parents can travel with. This is a nice baby monitor for parents who are on the hunt for a product that has a nice range of features. The priorities of this model are movement, sound, and temperature so if you are a parent who is always concerned with those factors, this product is for you. It comes with a great range of features from sound and temperature surveillance, and it can perform a good number of functions. This is a wireless model that lets parents move about in the house and finish their chores while keeping watch on their child without any trouble.